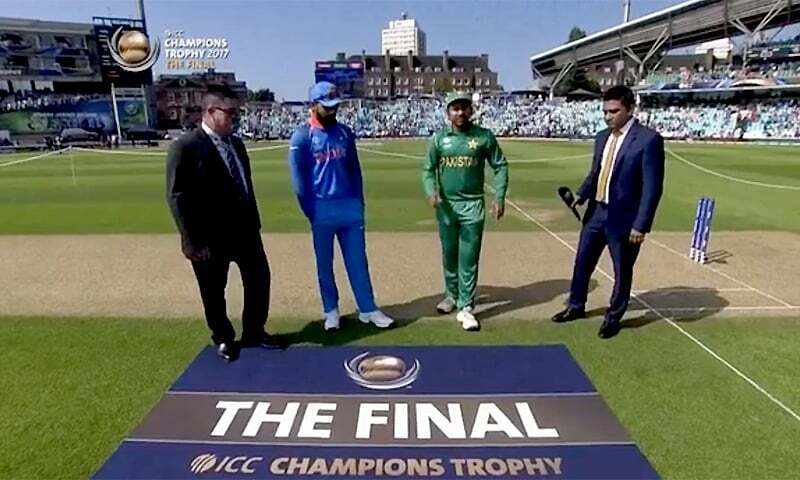 Pakistan thrashed favourites India by 180 runs to clinch the Champions Trophy title in a thrilling competition at London’s Oval ground on Sunday. The green shirts set up a daunting 339-run target with a loss of four wickets for the men in blue, but Indian batting collapsed under a calculated bowling attack, with all men out for just 158 runs in the 31st over. The score is Pakistan’s second-highest against India. The last time Pakistan beat India was in 2009 ─ also during a Champions Trophy match. Virat Kohli won the toss and put Pakistan in to bat first. The green shirts’ total was bolstered by a solid 128-run opening stand between Fakhar Zaman and Azhar Ali which set the mood for the first inning. Fakhar, who scored his maiden ODI century in style with a four off the 31st over, was awarded Player of the Match. The opening pair broke two records ─ one for the best score posted by Pakistani openers against India in an ICC tournament (86 runs), and the second for the best partnership against India in an ICC tournament when 100 came up for Pakistan in the 18th over. The last time Pakistani openers scored more than 100 runs prior to the fall of the first wicket in two consecutive matches was in 2003. This is only the second time the same has happened outside Asia. Pakistan’s trophy cabinet is complete! Azhar and Muhammad Hafeez both racked up half centuries, whereas Fakhar smashed 114 off 106 deliveries, and Babar Azam scored a solid 46 off 52. Left-arm fast Muhammad Amir kicked off Pakistan’s bowling attack, taking three crucial early wickets ─ those of Rohit Sharma, Virat Kohli and Shikhar Dhawan. Two overs into the match, opener Sharma succumbed to a LBW, whereas skipper and heavy-hitter Kohli was caught out by Shadab Khan, and Dhawan was caught out by Sarfaraz Ahmed. Hasan Ali matched Amir’s three, taking the wickets of MS Dhoni, Ravichandran Ashwin and JJ Bumrah. India’s lineup remained unchanged for the match, whereas Pakistan replaced Rumman Raees with Muhammad Amir. Amir had been ruled out of Pakistan’s semi-final against England due to a back spasm during a practice session. In Champions Trophy history, 2013 has been the only edition in which the team batting first won the final. The other 5 finals have been won by the chasing team.